You know that a group of crows is a murder and that an aggregation of lions is called a pride. 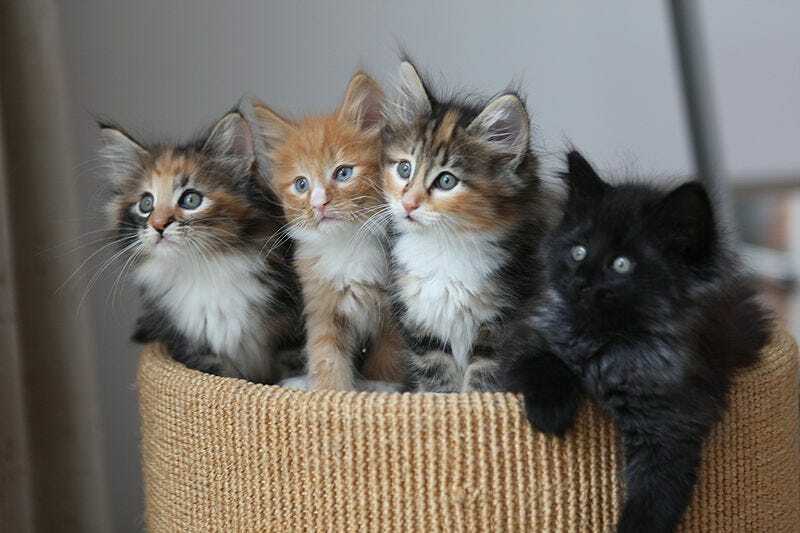 But what do you call a collection of kittens? A kindle. A kindle of kittens. 1. Multiple bears come in a sloth. A sloth of bears. I'm not sure how we get away with referring to a group of bears using another animal's name, but there you have it. A group of sloths, by the way? They're called a bed. Oysters and clams also come in beds, which, I guess, sort of makes sense?. Confused? Good. It only gets better from here. 2. You might think that buffalo come in herds, but you'd be wrong. They come in an obstinacy. Which, if you've ever tried to make friends with a buffalo, might actually make sense. North American buffalo gather in herds, but North American buffalo aren't actually buffalo in the first place. They're bison . 3. Say you've got a pet ferret, and then you invite each of five friends over, and they each bring their ferrets. What you've got is a business of ferrets. Amusingly, a swarm of flies isn't actually called a swarm, but is also called a business. Perhaps because if you've got a business of flies, you've got flies all up in your business. 4. If you asked most people, they'd agree that monkeys come in troops. Indeed, that's usually how they're referred to in the sciences. 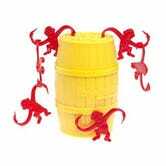 But you can just as accurately have a barrel of monkeys. One wonders whether the game came before or after the first use of the word to describe the primate groups. 5. Pigs can come in a drift, a drove, or a team. But if you refer to them as swine, what you've got is a sounder. A sounder of swine. Or a passel of hogs. Confusingly, a group of boars, the wild version of the domesticated pig? They're called a singular. A singular of boars. Because why should the English language ever make sense? 6. The reason that a group of rhinoceroses is called a crash is probably self explanatory. So is the fact that a group of giraffes is called a tower, and what you see in the photo above is a prickle, made of porcupines. We'll move on. 7. Say you're having a party, so you invite over a bunch of your (human) friends. Humans are apes, after all, so what you have on your hands is a shrewdness. A shrewdness of apes, which would therefore apply to chimps (which also come in troops), bonobos, gorillas (which are also called bands), and orangutans. 8. When a male donkey breeds with a female horse, the offspring is called a mule. Male mules are usually incapable of breeding themselves, which is why it totally makes sense that a group of mules is called a barren. 9. Most birds are capable of flight, but most groups of birds are not called flights. But that's not true for swallows, which are both capable of flight, and gather in flights. A flight of swallows. Which congregate in flights, even when they're not in flight, as in the photo above. Both confusing and clever, all at the same time. 10. Even though you're more likely to be killed by a vending machine than by a shark, sharks still have the ability to scare people right out of the water. They send shivers down your spine. Which is perhaps why a group of sharks is called a shiver. 11. So here's the thing. Groups of squid are called shoals, just like fish. But don't you think it would be better if squids came in squads? A squad of squid? The squid squad? I do. Make it happen, internet. There are plenty more. The US Geological Survey has collected a (partial) list of names for animal aggregations. What's your favorite clever or WTF name that we failed to include here?